The Alzheimer’s Association’s recently released report, The Impact of Alzheimer’s Disease on Medicaid Costs: A Growing Burden for States, found that between 2015 and 2025, Medicaid costs for people living with Alzheimer’s disease and other dementias will increase in every state in the U.S. and the District of Columbia. 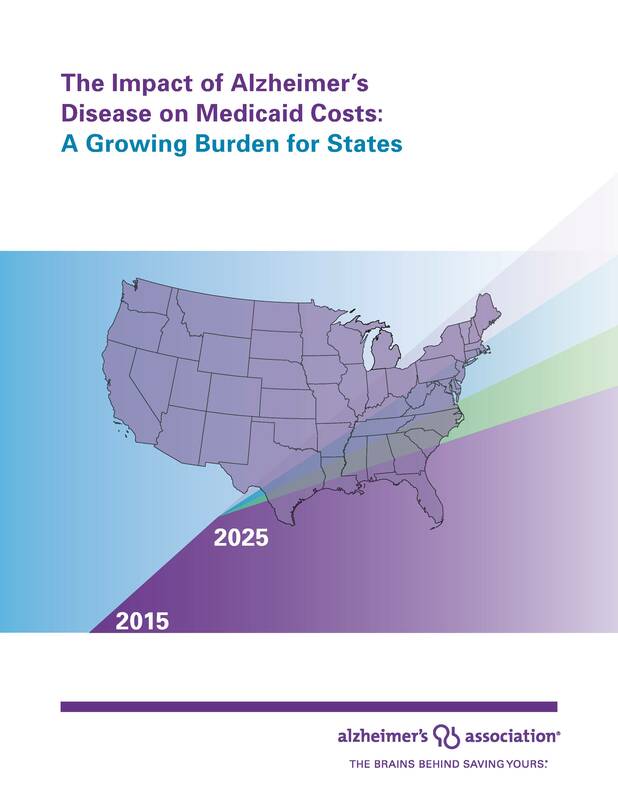 In fact, by 2025, 35 states will see increases in Alzheimer’s Medicaid costs of at least forty percent from 2015. Twenty-two states, including Virginia, will see increases of at least fifty percent. In Virginia, Medicaid spending on people with Alzheimer’s and other dementias will increase 60.6% by 2025. This year, spending will total $814-million increasing to $1.3-billion in 2025. Approximately ten percent of the 2015 Medicaid budget in Virginia is spent on people with Alzheimer’s and other dementias. Seniors with Alzheimer’s and other dementias rely on Medicaid, which is funded by state and federal governments, at a rate nearly three times greater than other seniors due to the long duration of the disease, the intense personal care needs and the high cost of long-term care services. According to the Alzheimer’s Association’s Alzheimer’s Disease Facts and Figures report, by the age of 80, seventy-five percent of people with Alzheimer’s and other dementias will be admitted to a nursing home, compared with just four percent of the general population. The quickly rising Medicaid costs for people with Alzheimer’s and other dementias in Virginia goes hand-in-hand with the rise in individuals living with the disease. Currently, there are an estimated 130,000 Virginians with Alzheimer’s and that figure will jump by forty-six percent to 190,000 individuals by 2025. “Virginia needs to implement the Dementia State Plan goals to ensure that the state is able to address the growing needs of the dementia population,” added Kolendo. To read the full report findings, visit alz.org/trajectory.